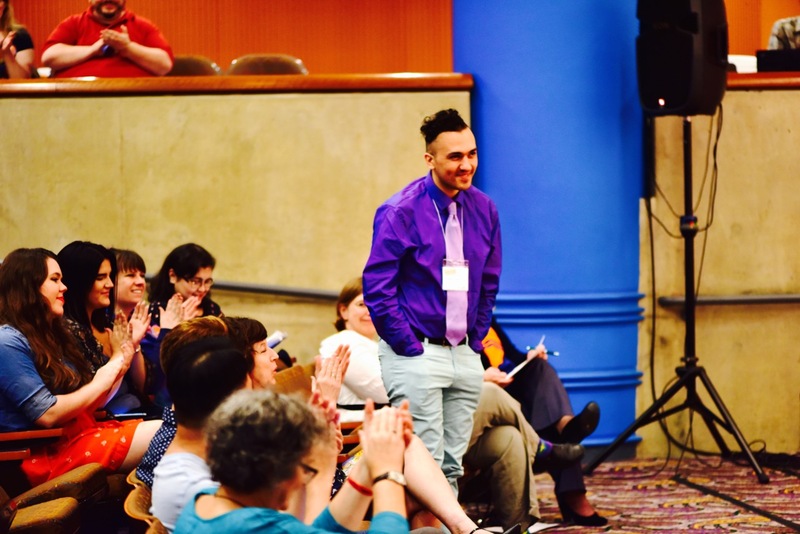 In 2016, the Ohio Center for the Book (OCFB) at Cleveland Public Library created a pilot “Ohio Center for the Book Scholar-in-Residence” position to honor and acknowledge the creative volunteer work of Kent State University doctoral candidate, Valentino Zullo. At that time he had already worked with OCFB as a volunteer comics scholar for 2 years, and had exciting ideas for future programming. Valentino Zullo discussing comics history at the OCFB in 2014. Mr. Zullo started with the Library as a book club participant, joining the Literature/OCFB book club celebrating the Anisfield-Wolf Book Award (AWBA) winners in 2013. The themes discussed – those of race, social justice, gender equality, disabilities, and others – these themes were some that, as a student of graphic novels at Kent State, Valentino wished to pursue further in the popular medium of comics. Bringing his ideas to the OCFB staff, he spearheaded the Get Graphic! Book Club. A Get Graphic! Speaker Series, Coffee & Comics workshop, and recently a graphic novel podcast with Nicholas Durda, Library Assistant in Literature and OCFB, grew out of that initial programming. Because of his association with the OCFB, Zullo became a regular speaker on comics in the Greater Cleveland area and at local libraries across the state. He also has presented at the Ohio Library Council Convention and Expo three years running. The Get Graphic! Book Club has explored issues of race, ethnicity, sexuality, gender, mental illness, global politics, and a range of other topics considered through the realm of comics. 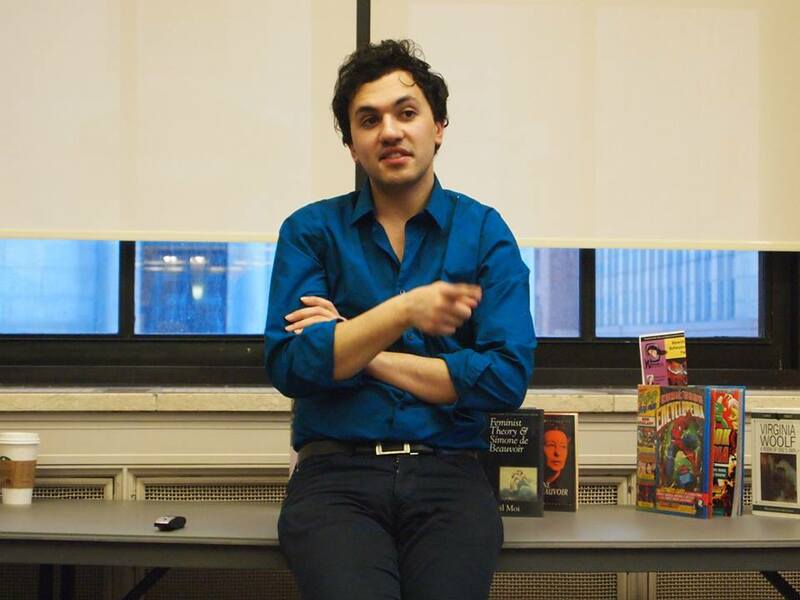 The series began with Mr. Zullo presenting a talk in 2014 on gender issues entitled Rewriting the Masquerade: Batwoman, Feminism, and the Female Superhero. With a Master’s degree in English and Women’s Studies, such discussions were featured in many of the programs to come. Women Warriors, for instance, was a series that explored the concept of intersectionality featuring female superheroes and villains and the ways that gender intersects with race, class, sexuality, and disability. Multiculturalism appeared often in the book series. In Memoirs of the Middle East, Book Club members became more educated citizens of the world, as they traveled through autobiographical comics that offered stories from Palestine, Iran, Turkey, and other locations. The chosen graphic memoirs and subsequent discussions offered an introductory history to the Middle East and twentieth and twenty-first-century politics. Valentino Zullo’s experience as a social worker informed yet another series entitled Evil and Empathy, where one’s ability to empathize with supervillains was considered. The goal of these programs was to promote life-long learning, personal growth, and community education. Interest and enthusiasm for the book club subject matter led Zullo to suggest the development of the Get Graphic! Speaker Series, where local artists and scholars were invited to share their work on comics. Included in this list was Dr. Vera J. Camden, Professor of English at Kent State University, and Clinical Assistant Professor of Psychiatry at Case Western Reserve University. She shared her research, recently published in the Journal of Graphic Novels and Comics, on Alison Bechdel’s Are You My Mother? Another exceptional speaker was Professor Tammy Clewell, also from the Department of English at Kent State University, who presented her work on World War I comics, also soon to be published. Dr. Brad Ricca of Case Western University, Dr. Charles Coletta from Bowling Green State University, Plain Dealer journalist Michael San Giacomo, and many other talented scholars, writers, and artists graced the podium of the Get Graphic! Speaker Series. Valentino Zullo, Vera Camden, and Jean Collins at the Get Graphic! Speaker Series in 2015. Witnessing the success of the Get Graphic! Speaker Series in connecting patrons and guests with humanities scholars, Mr. Zullo next suggested that actual hands-on workshops on comics creation would be of interest to the community. And it would fit well out in the community – specifically at a coffee shop and, he hoped, at Rising Star – his favorite coffee shop …! He approached the coffee roasters with the idea, and Get Graphic! Coffee and Comics was born in October of 2017. Included in the list of artists who have led comics workshops are: Marc Sumerak, former editor at Marvel; Tony Isabella, the creator of Black Lightning; Christopher Darling, Assistant Professor of Visual Communication Design at Kent State University; and Sequoia Bostick and Amalia DeGirolamo, comics publishers from Cleveland’s Vagabond Comics. The expansion of OCFB projects into the space of the Rising Star Coffee Roastery allows the Library to engage with a different segment of the public, and to explore greater possibilities for the role of the Library in the community. Yet another offshoot of Mr. Zullo’s work was the OCFB observance of Free Comic Book Day (FCBD), the first Saturday in May, involving the Main Cleveland Public Library downtown – for the first time – in the annual national celebration of comics and the distribution of free comics to one and all. Allowing the Literature/OCFB Department to partner with eight branch managers and staff, FCBD was extended throughout the Library community. Working with the local Carol and John’s Comic Book Shop to obtain the comics, the Library has seen increasing audiences over the past three years enjoy costumes, food, creative programming – and of course, free comics! Valentino Zullo, Allison Collins, and C.J. 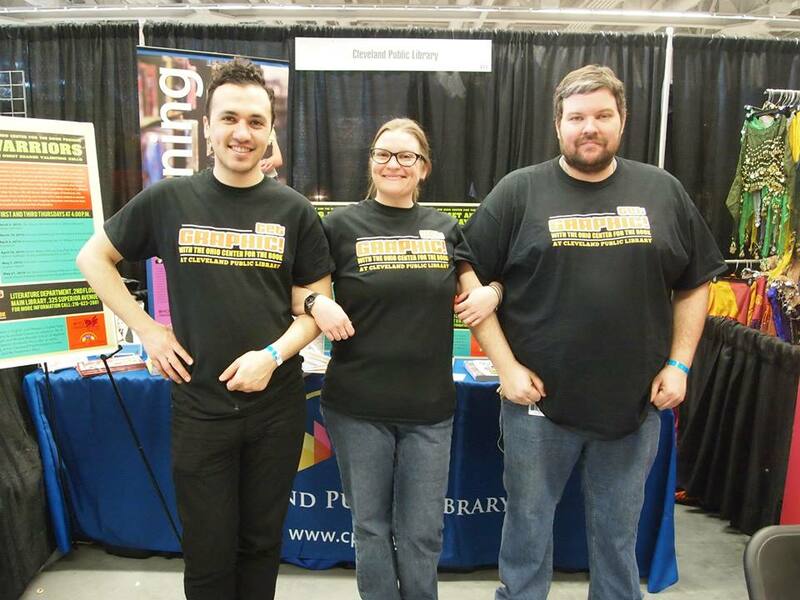 Lynch celebrate comics at the first Cleveland Wizardcon in 2015. 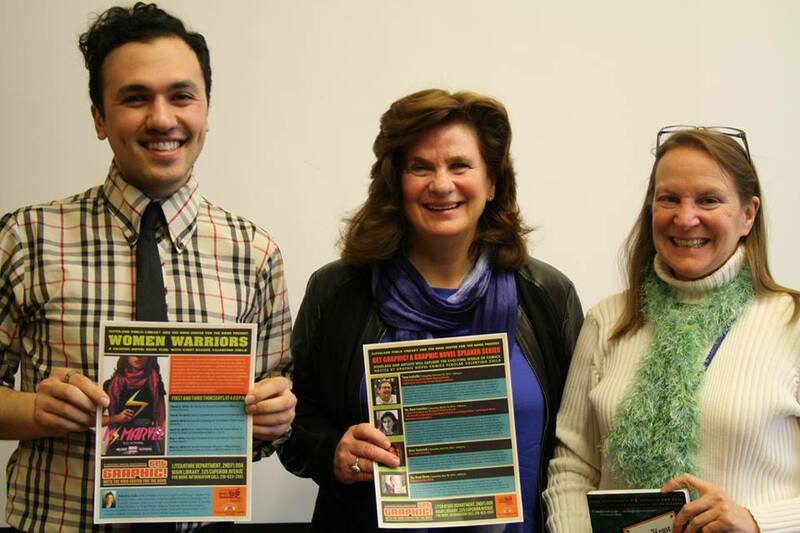 With grant support from the Ohio Humanities Council secured by Professor Vera J. Camden of Kent State University (KSU), and in partnership with KSU, Mr. Zullo assisted in bringing the Wonder Woman Symposium to Cleveland Public Library in 2016 (https://www.kent.edu/wonderwoman). His enthusiasm drew matching enthusiastic collaboration from OCFB Manager Amy Dawson, and OCFB Librarian Jean Collins, as well as partnership from the Friends of the Cleveland Public Library (now the Cleveland Public Library Foundation). Celebrating the intersections of public literacy, comics, and feminism, the 2016 Wonder Woman Symposium partnered two powerful public institutions in Northeast Ohio, taking up the historical trends that have changed the world of comics, American popular culture, and feminism. Centering on the figure of Wonder Woman and her heirs, the symposium featured addresses by major creators in the industry and historians of the comics world, and workshops by comics creators on creating graphic narratives and comics. The Symposium highlighted both regional and national talent, including comics stars Trina Robbins, Amanda Conner and Jimmy Palmiotti, Phil Jimenez, Cameron Stewart, Joan Ormrod (co-editor of the Journal of Graphic Novels and Comics), Carol Tilley, Genevieve Valentine, and Peter Coogan. Laura Siegel Larson, award winning CNN correspondent and daughter of Superman co-creator Jerry Siegel, and Christie Marston, granddaughter of William Moulton Marston, creator of Wonder Woman, both spoke at the Symposium and participated in the various forums. Attendees and Wonder Woman fans of all ages celebrated the day with a costume contest and Wonder Woman performances. The Symposium was a transformative event and one of OCFB’s and the Library’s most important successes. 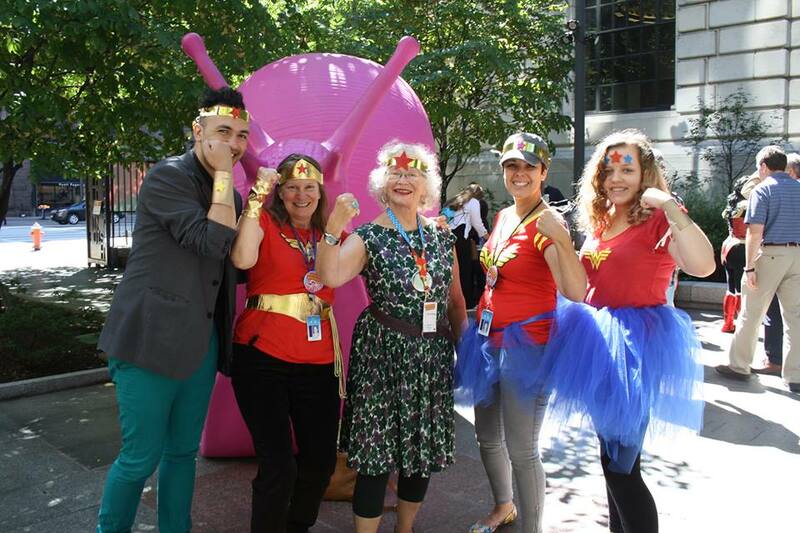 Valentino Zullo, Jean Collins, Trina Robbins, Melanie McCarter, and Harper Dawson-Glass show off their Wonder Woman attire during the Wonder Woman Symposium in 2016. Of the many benefits of the Get Graphic! program, the fliers and book club reading lists have been disseminated literally around the United States, with the Facebook site and podcasts just beginning to show their impact. Ohio Center for the Book’s Library Assistant Nick Durda spoke about creating the podcasts: “I have always enjoyed listening to podcasts. When I was presented with the opportunity to create a comic book podcast with Valentino I was very excited! This innovative way of examining comics and the evolving themes we are considering –immigration, violence, gender, and others—allow us to extend our programming outside the brick and marble walls of our building.” Listen to the Get Graphic! Podcast here. Valentino Zullo, both as a volunteer and as the first Scholar-in-Residence, has helped established the Ohio Center for the Book @ Cleveland Public Library as a hub for the study of comics and graphic novels. As the Ohio Center for the Book has as its mission to promote local authors, literacy, reading, and libraries, this is especially fitting, since there is an exceptionally rich history of comics creation in Cleveland, making comics discussion a natural fit for the OCFB. Starting with Superman’s creators Jerry Siegel and Joe Shuster, OCFB honors the local comics community including such stellar comics creators as Brian Michael Bendis, Brian K. Vaughan, Brian Azzarello, Harvey Pekar, and Jeff Smith, just to name a few of the most illustrious! Valentino Zullo at the Wonder Woman Symposium in 2016. Because of Mr. Zullo’s example of developing new and diverse programs, and engaging a new patron base, Literature/OCFB Manager Amy Dawson set out to formally define the Scholar-In-Residence position. She worked to get it supported with a stipend, hoping to attract other scholars with a similar skill in sharing their scholarship with the community here at the Library. The application proposal states: “The Library’s objectives for the Scholar-in-Residence position include promoting literacy; supporting critical thinking; encouraging cultural diversity; increasing and broadening patron and user participation in literature; encouraging literacy by connecting patrons and users with innovative ways to read and discuss literary works; promoting relationships and connections with local and statewide agencies; and more. … We believe that the investment in encouraging local scholars to join us in supporting the creation of a Scholar-In-Residence program will fulfill the needs of neighborhood-based services and collaborative programming while setting a foundation to promote literacy and a love of reading across the state of Ohio. This initiative will set an example for other Centers for the Book across the country.” View Scholar-in-Residence requirements and application here. Next: PBS’ The Great American Read: Voting Ends 10/18/18; Which Book Gets Your Vote?